Odin’s supreme will was that treasure-house of bounty towards which, in one shape or the other, all mortal desires turned, and out of its abundance showers of mercy and streams of divine favour constantly poured down to refresh the weary race of men. All these blessings and mercies, nay, their very source itself, the ancient language bound up in a single word, which, however expressive it may still be, has lost much of the fulness of its meaning in its descent to these later times. This word was ‘Wish’, which originally meant the perfect ideal, the actual fruition of all joy and desire, and not, as now, the empty longing for the object of our desires. 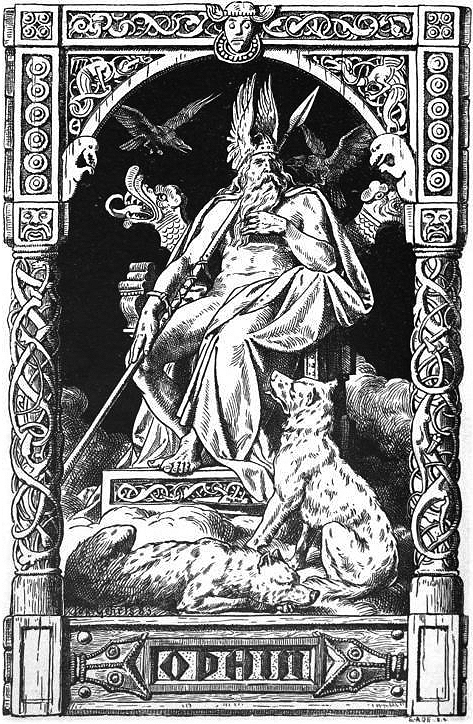 In different tales, Odin has been depicted in many, apparently contradictory ways: as the supreme ruler god, as a war deity, as a mysterious wanderer, or as a subtle shape shifter. These different manifestations may have endeared him to a wider variety of followers. Much of Norse mythology has, most undoubtedly, been lost since it did not begin to be recorded until the 11th century and thereafter. By that point, the inaccuracy of oral tradition and the influx of the Christian religion into the area may have corrupted the original tales. So, whether Odin dates back to Proto-Germanic times, or is a later addition to the Norse pantheon is not known. But, in Adam of Bremen’s account of Norse mythology (1080AD), he attests that Thor, not Odin, is the mightiest of the gods. This does seem to infer that some sort of a change in the perceived power of Odin did occur after a Christian influence. Another indication of a similar tenure of the crown occurs in a curious legend of the deposition and banishment of Odin. Offended at his misdeeds, the other gods outlawed and exiled him, but set up in his place a substitute, Oller by name, a cunning wizard, to whom they accorded the symbols both of royalty and of godhead. The deputy bore the name of Odin, and reigned for nearly ten years, when he was driven from the throne, while the real Odin came to his own again. His discomfited rival retired to Sweden and was afterwards slain in an attempt to repair his shattered fortunes. As gods are often merely men who loom large through the mists of tradition, we may conjecture that this Norse legend preserves a confused reminiscence of ancient Swedish kings who reigned for nine or ten years together, then abdicated, delegating to others the privilege of dying for their country. The great festival which was held at Upsala every nine years may have been the occasion on which the king or his deputy was put to death. We know that human sacrifices formed part of the rites. Phyllis Siefker sees parallels between Odin and another popular figure: Santa Claus. While the name Santa Claus is most certainly a derivation of Sinterklaas, Dutch for Saint Nicholas of Myra, the custom of placing shoes or stockings in front of the fireplace seems to stem from a Yule custom in which children would put straw in their boots for Odin’s horse. During the course of the night Odin would use his shape shifting ability to come down the chimney, take the straw and leave candy in it’s place. Warning: Hot to the touch! Until this week, Mary Jo Coady had never given her iron a second thought. Then she saw a likeness of Jesus staring back from its not-quite stainless steel bottom. Well, it’s not that great of a Jesus. I’ve seen better. But, at least it’s not the “Virgin” Mary. Those get a little old. She simply thought others of faith might want to see an image that surprised her, cheered her, and made her want to return to St. Lucy, her Catholic parish, after a difficult two years. That hardly seems likely. 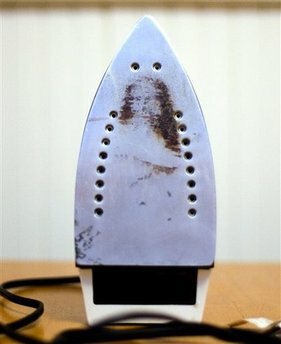 It God wanted her to return to the Catholic Church, he would have put a Virgin Mary on the iron. Or a saint Who-its. He obviously wants her to switch to Pentecostalism. You can tell by how ecstatic the Jesus looks. He’s looks like he about to get up and dance. “I think it’s how we interpret things. It’s more of a personal thing. God works in his or her own way,’’ said Keyes, who believes that God or saints might choose to appear “in person, as opposed to on a toaster, or a cinnamon roll or a Frito, or whatever. But then, God does what it wants.’’ A spokesman for the Archdiocese of Boston did not comment yesterday. Don’t even need to comment on that bit. Hilarious. I do like how she refers to God as “it”, though. Coady’s iron is otherwise unremarkable: manufactured for the Wal-Mart house brand, with a basic dial for fabric settings and a steam/dry switch. Steam! But, that’s Satan’s work. That’s not Jesus at all, it’s … it’s … Rick Astley! Glenn Beck, master of dicking with American consciousness for profit, has dissed Sarah Palin’s invitation to be her running mate in 2012 with a few choice words. Will he lose fans over this sexist remark? Probably not. Beck’s style, of course, is to say everything in a mocking condescending way so he can later deny responsibility for anything he says. Does he dislike Palin? Or just hate women? Oh, neither, it’s all just a joke that I’m sure everying in the audience in in on. He doesn’t have any woman haters or bigots in his audience, they’re all bright, educated, civilized people that respect each other and are only joking around. This sort of fuzzy correspondence is nothing new in the conservative movement. They seem to base their entire platform on it. During the last election, the McCain campaign felt the need to encode their disregard for the Establishment Clause with the phrase “religion in the public square” (any follower of a dying and rising savior god that wants to get up and a stump and start make a speech sure can do so, but they have about 20 seconds of my attention to say something interesting). Of late, some Funda-gelicals have felt the need to hide presidential death threats with Bible verses. Chuck Norris, apparently, believes he has lost his freedoms, but can’t seen to stick his finger on what these freedoms are. If the leaders of these movements can’t be more concrete with their intentions, then do their backers even know what it is that they are backing? I have a feeling they don’t. As this video of Sarah Palin fans shows. They define themselves as supporters, but when asked why, they’re not quite sure. They are so excited by buzz phrases and personality that they have no idea what Palin’s actual plans are. Fluffy messages and feel good/bad words are not a plan make. Actual honest to goodness intentions must be laid out. Otherwise we wind up with a bunch of angry people that have no idea what the hell they are angry about. But, if starting a mob and using them as your pawns is all you’re interested in, well, then I guess you couldn’t do better than the conservative movement. Vagueness is the great leveler. Sources have revealed that the “Old Pope”, Karol Wojtyla, aka John Paul the 2nd, would, at least on occasion, flagellate himself as a form of penance. This old school method of penance was officially banned by the Catholic Church in the 14th century and is usually kept pretty hush within the church, but the Opes Dei order as well as Mother Teresa have also partaken in the practice. “As part of the Vatican’s investigation, thousands of documents have been examined by officials from the Congregation for the Causes of Saints. Among them is the testimony of Polish nun Tobiana Sobodka, a member of the Sacred Heart of Jesus order. She worked for Pope John Paul in his private Vatican apartments and at his summer residence in Castel Gandolfo near Rome. Sister Sobodka said: “Several times he would put himself through bodily penance. The whipping is also confirmed by Bishop Emery Kabongo, for several years a secretary for Pope John Paul. Didn’t God Create the Solstices? Time for another nativity in a courthouse debacle. Yep, it looks like the Right’s infamous “War on Christmas” is beginning early this year. This time, it’s in the Arkansas state capitol building whose Christmas decorations are up and include … a nativity scene! However, when the Arkansas Society of Freethinkers created a Solstice display for inclusion, it was denied. Well, consistency is a virtue, or so I’ve heard. But, when it comes to favoring Christianity over other religious orientations, I think putting up a placard should be a pretty minor issue. Besides, from my studies of religion, I have come to the understanding that Christians believe that their “God” created the entire universe. Which would, by the way, include the Earth and the sun. Coincidentally, these two objects, once you understand that they rotate and wobble a bit, are all you really need to get … the solstices. So, what’s their problem? Wouldn’t a solstice scene only be glorifying their creator? I guess the problem would be that it would include non-Christians during the holiday season. And that, apparently, cannot be done. Well, needless to say, the ACLU is looking into it. Perhaps we should also get their mothers to give them a talking to as well. If they cannot choose to be nice to others, perhaps they need to be told. Anubis was the ancient Egyptian god of the afterlife. He was associated with the embalming, a practice that was associated with the concept of an afterlife. Anubis is known for his characteristic jackal head. He was frequently depicted carrying the Ankh, a symbol for eternal life. Since he also shared the similar purpose of guiding souls to the underworld with the Greek god Hermes, the deities were syncretized during the Hellenistic period as Hermanubis during the Roman occupation of Egypt.